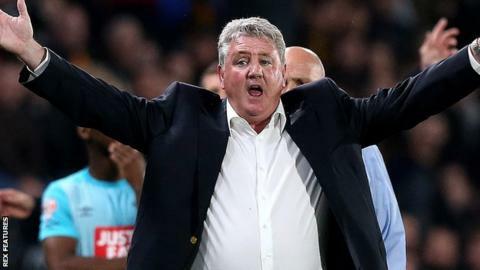 Hull City manager Steve Bruce has said there are "no excuses" for a poor performance in the Championship play-off final against Sheffield Wednesday. Hull stuttered in their play-off second leg as they lost 2-0 at Derby County, but went through 3-2 on aggregate. "If we do get to the heights then it takes a very, very good team to beat us," Bruce told BBC Radio Humberside. "It's a really difficult league but we've given ourselves an outstanding chance of getting promoted." He continued: "We have none of the excuses, now we've had 10 days to prepare and a whole week to build up to face a good Sheffield side. "We are capable of putting in an awful performance, which usually happens in the second or the third game in a short period of time, but we know we can perform." In an 18-year managerial career, Saturday will be Bruce's first trip to Wembley to watch his team compete in a play-off final. City are likely to be without first-choice goalkeeper Allan McGregor, who has kept 18 clean sheets in 44 appearances this season. McGregor missed both legs against Derby because of a back injury, with Eldin Jakupovic deputising. Hull and The Owls drew both of their meetings in the Championship this season, with Bruce's side finishing nine points above sixth-placed Wednesday. "It's easy practising on a training ground; it's like practising penalties, every one of them smashes into a top corner, no problem," added Bruce. "That goal shrinks a little bit when you are in front of 100,000 and what's at stake. It's about handling the occasion."